Over the years skiers have asked for taller pylons which we call extended pylons or hylons. It did not take long until the towers came onto the boating scene. There are even towers with hylons on top of them. We have sold Dyna-Ski boats with towers although I do not suggest them for several reasons and I prefer a Hylon for many reasons. The list is long including: cost, noise (towers rattle eventually), wind drag, wind noise, boat lift/canopy fit, garage fit, cover issues, etc. However we will sell you whatever you prefer! With an extended pylon or hylon you can put it on the boat and take it off fairly easily depending upon which one you choose. If you quit using a tower in the future years you won't still have to contend with it if you go with an extended pylon. If you decide you want a tower it can be added at any time. The brand I like and sell is Barefoot International. We also use or sell their towers. They are located in Milwaukee. Owners Mike and John have high quality products that are reasonably priced. There are several lengths of pylons in Dyna-Ski boats. The standard Dyna-Ski pylon diameter is 2 7/8" and the length varies according to the application and motor size. The longest standard Dyna-Ski pylon is 48". We also have a 83" pylon to replace the existing pylon made for us by KW Show Ski Equipment. KW also makes our rope guards and tow line releases. The 83" pylon has a limited load capacity as it does not require a strap to use. All Dyna-Ski pylons are pinned into a base bracket that is fastened to the floor. 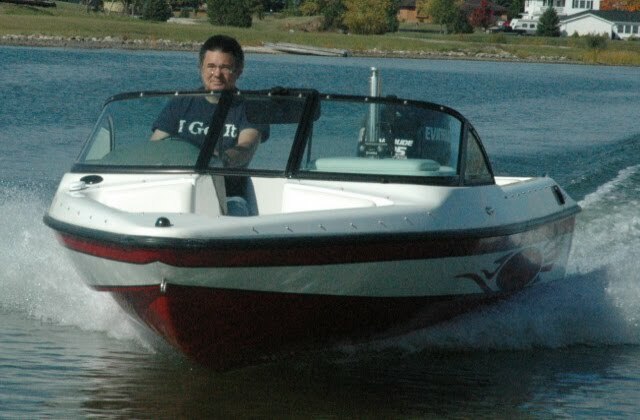 On some Dyna-Ski boats the base bracket has two mounting positions or heights for the pylon. Dyna-Ski offers a machined adapter to mount a Barefoot International/Fly High pylon extension to the Dyna-Ski Pylon. Below is the adapter on a pylon. The options and things skiers do change all the time. The nice thing about Dyna-Ski is we custom build every boat to the specific customer's needs. We don't try to sell you a boat we have in stock or left over from last year or the year before. 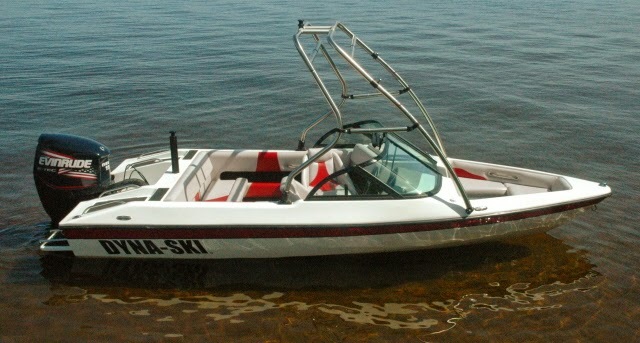 Dyna-Ski won't hurry a Dyna-Ski Boat completion or take any short cuts. You get what you pay for in the end. Maybe that is why you never see any used ones . . . . . ..